I have decided to run away for a bit. For the last seven years I have essentially worked non-stop. I’ve studied at school, held part-time jobs throughout those months, and I’ve worked summer contracts to keep myself afloat. But now, thanks to some leftover scholarship money and some intense saving, I have enough money to leave the country and go on an adventure. I’ve always wanted to travel. I’m a closet introvert, and the idea of venturing off into an unknown country has always scared and excited me. After finishing my Master’s degree, I decided to finally do it. I would start to travel on my own. I would see the world. As of now, the “world” is essentially Europe. In a few days I will be travelling across the UK, France, and Italy, while making a few stops in Munich and Amsterdam. It’s all I can afford right now, but I’m hoping it will give me the confidence I need to continue exploring new places. Along the way, I will be posting photos on my Instagram page. I would love to say I will be updating my blog, but that all depends on wifi availability (and whether or not I slow down long enough to write a post). Most likely, I won’t be posting anything on this website until I return. Throughout the month of September, I travelled. I got on a plane by myself and flew to a distant land, unsure of where I was going or what I would do when I got there. It was a bit terrifying, but also exhilarating. I am a naturally anxious person—an extreme introvert, despite the fact I’m a journalist and my job is to talk to complete strangers. I get nervous easily, and tend to freak out if my “plan” doesn’t go…well, as planned. I knew this trip would be an eye-opening experience and I hopped that it would help me become more confident in myself. For the first 15 days, I decided to do a tour with Contiki. My theory was that it would be a perfect buffer for my organized self. We would have schedule, and then some free time when I could do what I wanted. I wouldn’t be completely alone on my first trip to Europe, but I wouldn’t know anyone on the tour either, which would force me to open up to people every day. After that, I would spend a week in the UK—courtesy of a friend who let me stay with him in Oxford, Thanks Tyler Shendruk!! !—exploring on my own. To write about everything I did would mean an EXTREMELY long blog post. I’m going to pinpoint the best moments from each city I visited and what I learned along the way. ENJOY! I arrived at Heathrow airport around 6 a.m., completely exhilarated. I found my suitcase, jumped on the “tube,” and headed to Westminster, where my hotel was located. My plan was to check in my luggage and then explore the city before the Contiki meet-and-greet. The challenge: to orient myself. Before I left the homeland, I downloaded some maps on to my phone, which I could access without using data. But, I wasn’t sure where I was actually situated on the map. After a lot of wandering, I finally found myself in, what I would call, the centre of Westminster. I visited a number of places—the Sherlock Holmes museum, Regent Park, a random restaurant where I had a full English breakfast (does anyone else think the beans taste like alphaghettis? )—but my favourite was the British Library. I totally geeked out looking at original manuscripts from Charles Dickens and Shakespeare. I saw one of the first pieces of music ever written. It was absolutely amazing. My second favourite moment was heading to the hotel pub after the Contiki meet-and-greet, where I met some great people and developed friendships I hope will last the distance. To pick a single moment from my time in Paris is impossible. 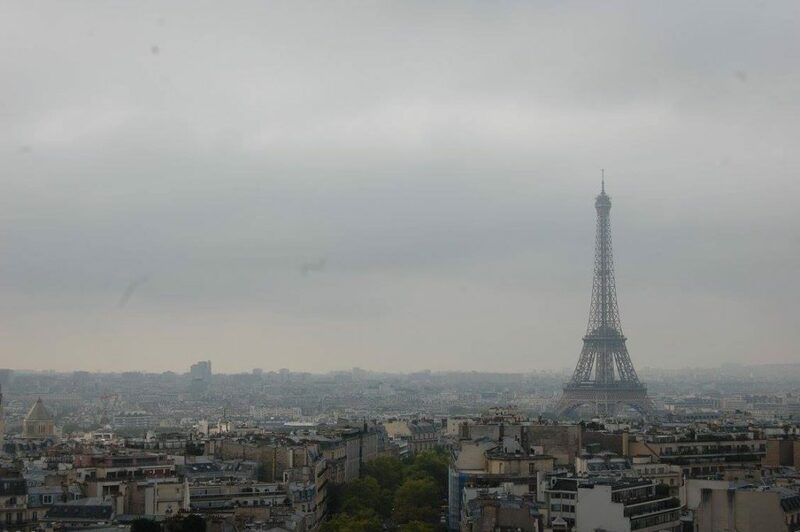 I saw the Eiffel Tower, went up the Arc du Triomphe (so many stairs! ), and visited the Mussee D’Orsee. The cobblestoned streets of Paris wind and twist — I imagine it took us twice as long to get to the Eiffel Tower than it was supposed to from the Arc du Triomphe. Half way through our “free day”, I decided to sit down in a restaurant for lunch. The planning-side of my brain was telling me to keep going. If I booked it, I could make it to a few more places before I had to head back to the hotel. But, I knew that if I didn’t take a minute to breath, I would miss it—I would miss the fact that I was actually in Paris. I ordered a baguette, some cheese, and some red wine, and I just sat there, watching the true Parisians wander the streets. “I am in Paris,” I told myself. I really knew I was in Paris when my “world adapter” plug, which was supposed to allow me to blow dry my hair and charge my phone in every country I visited, blew a fuse. The next two weeks were actually a lesson in how little I needed my hair products, makeup, and technology. The view of the grape plants in Lyon. Bought a lovely bottle of wine. This picture pretty much sums up my trip to Lyon. It was more of a stop-over. We tasted some wine and explored the grounds, but otherwise it was just a party stop. We stayed in a gorgeous chateau (at least it was gorgeous on the outside), overlooking the vineyards. This moment, where I was just relaxing with some new friends, enjoying the beautiful weather, was as good as it got. 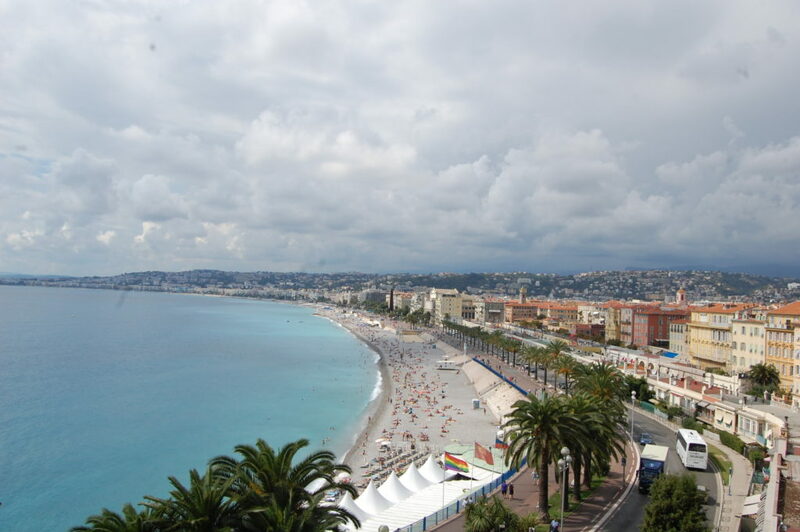 View of Nice from above. Nice was one of my favourite places in Europe. Despite the flu I was developing from my travels, I felt completely comfortable there. It was quaint and full of culture. The outdoor markets were crammed and lively. The group I was with walked up the seemingly never-ending staircase to get to the top of an abbey overlooking the city, and that’s where I was able to capture the marvelous view you see above. It was also at that moment we decided to swim in the ocean. What we didn’t realize was that the beach was made completely of rocks, and we didn’t have any water shoes. It must have been a hilarious sight, three girls (obvious tourists), trying to get in the ocean, while balancing on rocks of multiple sizes, combatting the waves that were constantly trying to tip us over. We eventually decided that crab-walking on all fours was the most efficient way to get out of the water I felt like a child, completely giddy. On a side note: We got lost in the train station trying to get back to our hostel. While it was a crazy and frustrating experience, it also gave me the opportunity to practice my French. Turns out, I’m not as terrible as I thought. We all made it back in one piece, with exactly 20 minutes to get ready before the group head out to Monaco for a night out. We hit the casino, and then a rooftop patio, where I purchased a ridiculously expensive beverage. Luckily, at $25 a drink, the single purchase was extremely tasty. 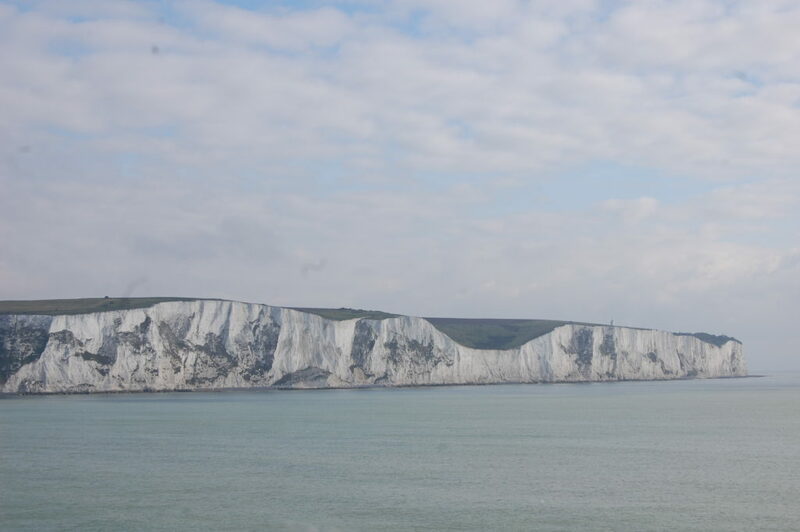 Plus, the view was extraordinary. This was our first stop in Italy. Our first day in Florence was mostly a travel day. We arrived in the evening and had about 45 minutes to get settled into our lodgings and get ready for dinner. We stopped on the way to the restaurant to take a few group pictures (and a few of our own) near a lookout with an absolutely beautiful view. Our first day in Florence was also the day I realized the Italian’s really know how to eat. I think our dinner was six courses in total. It’s hard to remember because the food just floated out. There was meats and cheeses, spaghetti (apparently an appetizer), ravioli, beef with potatoes and vegetables, dessert, and then a shot of a yellow liqueur called Strega, which is supposed to be drunk at the end of a meal to help with digestion. And then there was copious amounts of red wine being passed around the table. We went to a Karaoke bar afterwards, where drinks were served in pitchers … and no, I’m not exaggerating. One of the funniest parts of the evening was the taxi ride back to our hostel. The driver raced down the narrow side streets, moving in and out of lanes, honking at those moving at the speed limit. It was quite the ride. I also splurged a bit in Florence. We went to a leather demonstration, and I bought a few bracelets for my sister and my mom. I also got a gorgeous leather purse (a small one); although I haven’t had occasion to wear it yet. 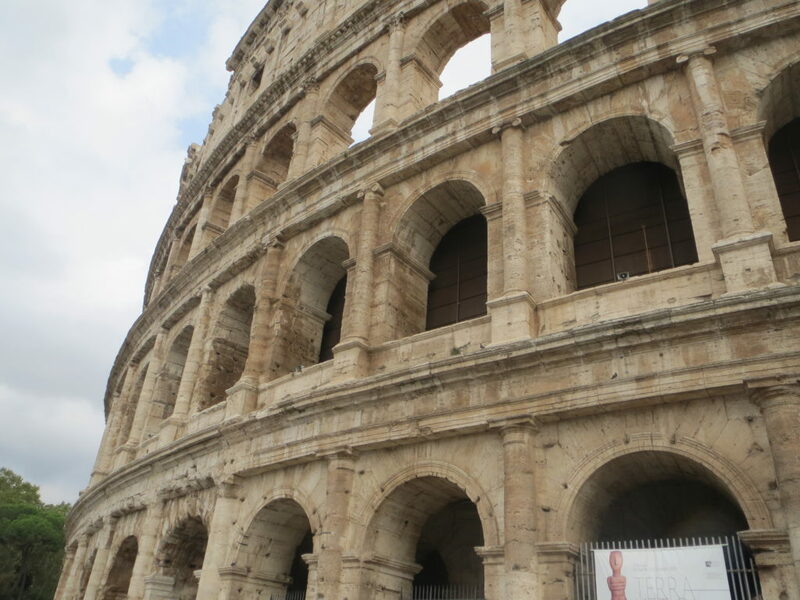 We were only in Rome for a single day—which was unfortunate because I was so sick. The flu I had been fighting off since Nice came to a full head. My sinuses were so clogged that my face was in physical pain. I had been taking decongestants for the last three days, to no effect. I tried to make the best of it though. Our first stop was the Vatican. It was warm and overcrowded, but it was totally worth the trip. The ceilings and walls throughout the buildings were absolutely beautiful. At one point, I thought I was looking at quality sculpture work, until I got closer and realized I was looking at a tapestry or a painting. Finally, there was Michael Angelo’s ceiling in the Sistine Chapel. No photographs were allowed, and I was glad. The ceiling was so beautiful, it would have spoiled the moment to immortalize it with a selfie. The next visit was to the Colosseum and the Pantheon. Both were equally impressive buildings. The structures are so large — it’s strange to think that humans made these immense structures. I’ll have to go back to Rome someday when I don’t have the flu. I really struggled to get through the day.